Martin Truex Jr. finally has a win at a short track. And a team not named Joe Gibbs Racing or Team Penske still hasn’t won a race in 2019. 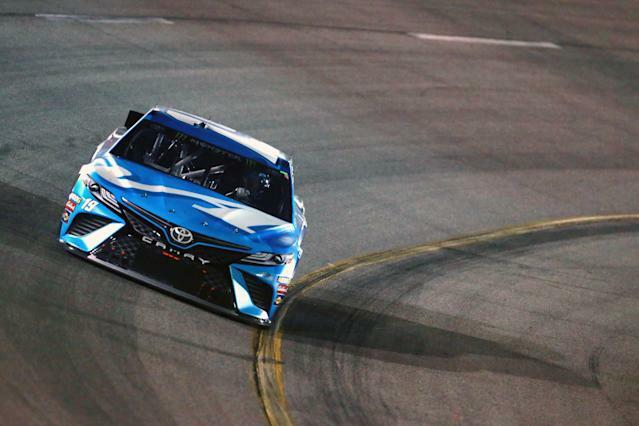 Truex held off Clint Bowyer and then Joey Logano over the last 25 laps of Saturday night’s race to get his first win of 2019 and his first win at a track less than a mile in length. Truex pulled off the win with a car that he said wasn’t performing too well over the final tenth of the race. It was his first short track win in over 80 starts. Eight of the race’s 37 starters and four of the top 10 starters failed pre-race inspection Saturday afternoon. All the cars that had failed inspection had to start at the back. The race also didn’t feature any multi-car crashes and continued a 2019 trend of tame racing. The only two incidents came because of flat tires. Kyle Larson crashed into the wall because of a flat and so did Michael McDowell. Kyle Larson’s having a bad 2019 season. Contact caused a tire rub on Larson’s left rear tire early in the race and he came to pit road so the team could pull the fender and prevent a flat tire from happening. Well ... the fender pulling wasn’t good enough. Larson returned to the race and soon found himself in the wall because of a flat tire. He drove the car straight to the garage and ended up in last place. Larson is now 19th in the points standings and 204 points back of the points lead. The driver in 12th this year, Daniel Suarez, is 165 points behind Busch. Ryan Newman, the driver in 17th at this time a year ago, was 229 points off the points lead. William Byron is currently in 20th in the standings and he’s 38 points closer to the lead than the 20th-place driver was a year ago. What classic is NASCAR talking about? NASCAR fired off a tweet calling Saturday’s race a “classic” after Truex’s win. RECAP: @MartinTruex_Jr holds off @joeylogano on the final lap, wins a classic at @RichmondRaceway. Sorry, Truex’s win wasn’t a classic. Yeah, it was nice that he got his first short track win and his first win with Joe Gibbs Racing. And while the race produced a close finish, there’s nothing extremely memorable about it unless you’re a Truex fan. A classic is a race that you remember for a long, long time. Non-Truex fans may forget who won this race in a couple months. Calling Saturday night’s race a “classic” continues NASCAR’s desperate trend of overselling anything and everything. That’s dangerous. When you oversell everything you soon realize you have a hard time selling anything.